As my regular readers probably know, I live in Malaysia. I am from the US, but have lived here for more than 12 years now. When I first came to Malaysia I brought my quilling supplies with me. I occasionally ordered more quilling papers from the US, but it wasn’t until years later that I saw a few random quilling supplies available here. Still, it was very little. 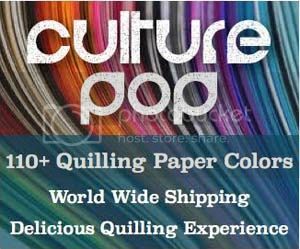 So several years ago I opened my own online quilling supply shop, as I wanted to provide quillers here with high quality, easily available, supplies. 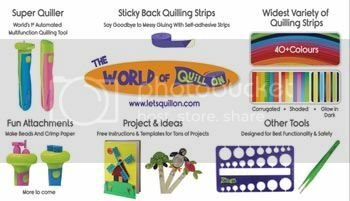 Several months after I opened my shop I found out that there was another local person selling quilling supplies and they were a distributor of the Quilled Creation brand. It was great being able to easily get all of the supplies from that brand right here in Malaysia. I was surprised I hadn’t heard of it before, though! Beyond that brand I also imported Lake City Craft and later Paplin products, as they are both great brands as well. Most of my own personal supplies are from Lake City Craft. As time has passed more places have been offering quilling supplies for sale. That, in combination with my life getting busier, helped me to decide to scale back my own supply shop and leave the business to others. I love writing on my blog and offering tutorials, and I didn’t have time for both that AND selling. Luckily I didn’t have to leave my customers high and dry. There are a good number of places in Malaysia now where you can buy quilling supplies. Click here for a list of all of the places, plus places from other countries around the world, where you can buy quilling supplies. I wanted to write this post today and list all of the Malaysian sources here (even though they are also on that other page) and a couple other sources that sell related goods. Hopefully my fellow Malaysians will find this helpful! SF Quilling Craft – at SF Quilling Craft you will find the basic tools – slotted tool, circle guide, a variety of quilling strips, and more. You can also find the liquid matte sealant and glossy topcoat that I used to sell. Perfect for your quilled jewelry, magnets, etc. Aifel Craft Cottage – At Aifel Craft Cottage you will find the entire range of Quilled Creations products. These are high quality and some very unique goodies for your paper quilling projects! You can also find die cut machines and other fun scrapbooking goodies. Crafty Diva’s – At Crafty Divas you will find a wide selection of quilling supplies, mostly from the Quilled Creations brand. Desire Creations – Desire Creations is a new shop, I just found out about it a couple months ago. They have a wide variety of quilling supplies! Find the basic tools plus things like quilling comb, quilling molds, “border buddy” type tools, and more. These are what I call “off brand”, so they are less expensive. A great choice for those on a budge who still want to have some fun with some great tools! Azlina’s Handmade Tools – Here is something fun! Azlina has a quilling blog and for years she has been designing homemade quilling tools. She has a batch of her best one yet that she is selling. Click the link to see photos and contact her for purchasing information. Her goal is to be able to offer good tools at affordable prices! Crafting Shops – Some of the malls here have craft shops. For example, 1Utama has one, I forgot what it is called, though. They often have a small selection of quilling tools, papers, and sometimes quilling boards or other sparse supplies. It is a good place to grab something if you are there and you need it right away. Prices do tend to be higher, though. When I first started making quilled jewelry, the only supplies I had were those that I had bought in the US. I had no idea where to buy jewelry supplies in Malaysia. Therefore I wasn’t very adventurous with the supplies I had, only using the minimal number of jump rings possible, etc. Somehow several years ago I came across this website, beading.my WOW! Finally I could get a wondrous supply of jewelry findings at great prices! And they have such a fun and wide selection. Love it! If you know of any other places in Malaysia where you can get quilling supplies, don’t hesitate to leave a comment or contact me and let me know so I can add it to this list and/or the original supply list page! *There are no affiliate links on this post. I am offering this list of shops as a service to my fellow quillers here in tropical Malaysia, and I hope it helps! Any products that I have from any of these shops I have bought myself.